Fortunately, I don't buy comics. But we have to make that the ohter fans don't buy it, or the sales be less. And, I hope too that the King's career in Batman don't be foundamental. Thanks, men. You are great. Now, I will continue with this page. Very good. DC has to eliminate Batbadcat and make WonderBat. Or Warner has to give Batbadcat to other person. WonderBat is better. Yes. Until the Batbadcat crew gets fed up of the Batbadcat relationship, but will be a long time until that happen. It's terrible. I'm more angry now knowing that we are going to wait and that Batbadcat, like many Stuperwonder and Wonder*rev fans, it's so difficult that they get fed up of that. WonderBat i happen someday. And, the true love that we have for WonderBat waits. I hope we will live long enough to see it happen. So who's been reading Tomasi's Detective Comics ? Beside being a fantastically written, authentic, and heroic, it's got a very....anti-Tom King feeling about it. There are more than a few instances where it seems like Tomasi is blatantly shooting down King's ideas about Batman, and these instances have been popping up more frequently with every issue. Anti-Tom King is the best way to describe Tomasi's run so far, and here are a few examples from last two issues. 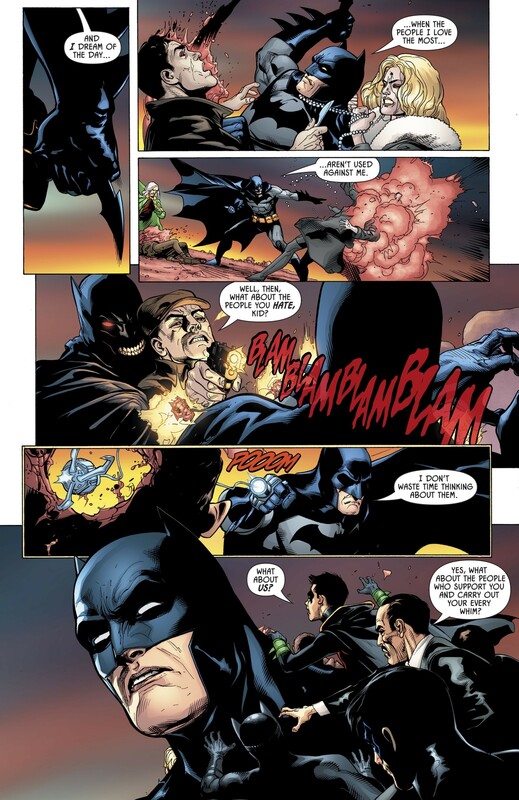 From issue 997 we got this sequence, where the villain is attempting to undermine Batman's resolve by trying to assert how he's only made up of tragedy, sadness, and fears, only for Batman to shoot him down immediately and confidently. 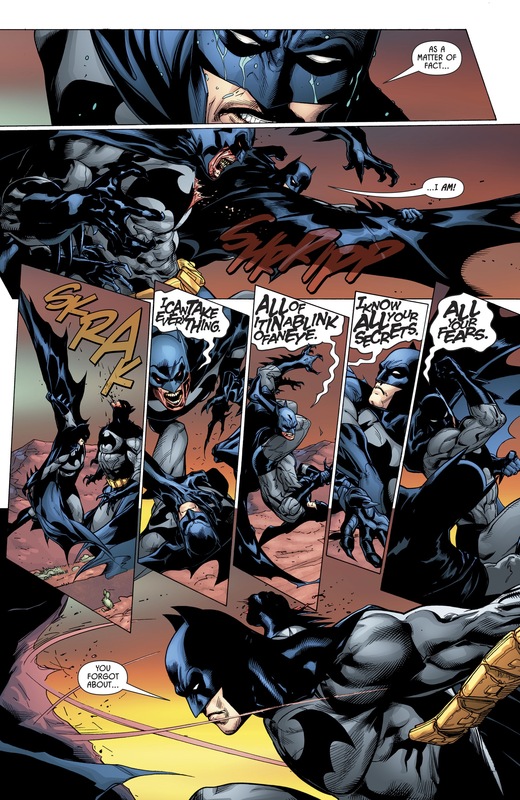 An entire sequence where Batman is decisive with an unwavering resolve. Had this been written by Tom King, Batman would've faltered the moment his parents' death was brought up, but Tomasi had him simply shrugging it off because this Batman, and he shouldn't be reducing into a sobbing mess the moment he's reminded of the death of the Wayne's. Two more things, the monster haunting Bruce uses the face of Catwoman in two instances. The first in a previous issue when she was included among a number of Batman's most well known villains. 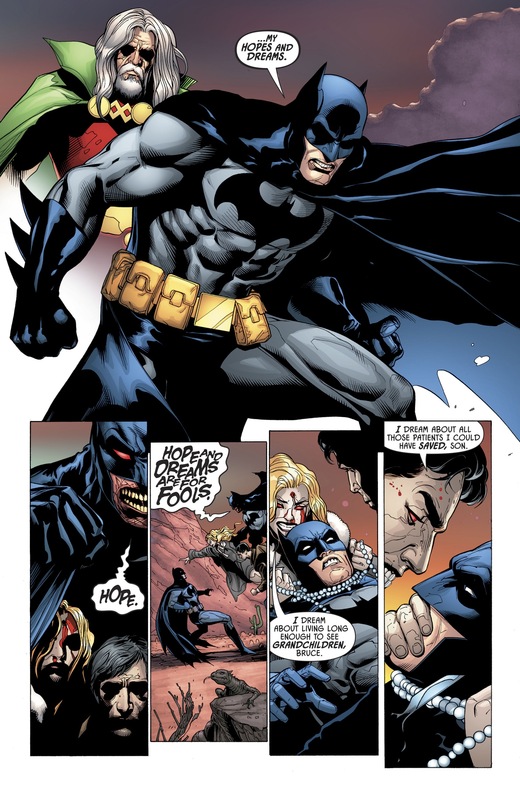 The second was this issue where she's included among the Batfamily. In both instances the only thing that comes out of her mouth is "love", which I found to be hilarious, and a possible nod to King's Batman. The second was the surprise appearance of Thaddeus Brown, the original Mister Miracle, and having Batman wearing a torn Mister Miracle mask on the cover. Coincidence ? 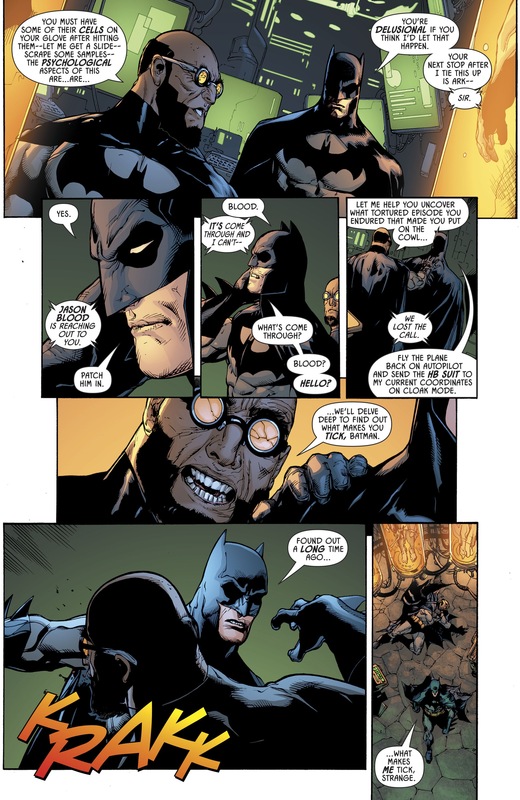 Issue 998, beside being an awesome action packed issue, had this interaction between Bruce and Hugo Strange, who's obsessive about breaking Batman and down and "deconstructing" him to know "what makes him tick", only for Bruce to give him a most appropriate answer. I'm loving how confident and sure of himself Batman is in this book. No more moping around and obsessive navel gazing that leads nowhere. 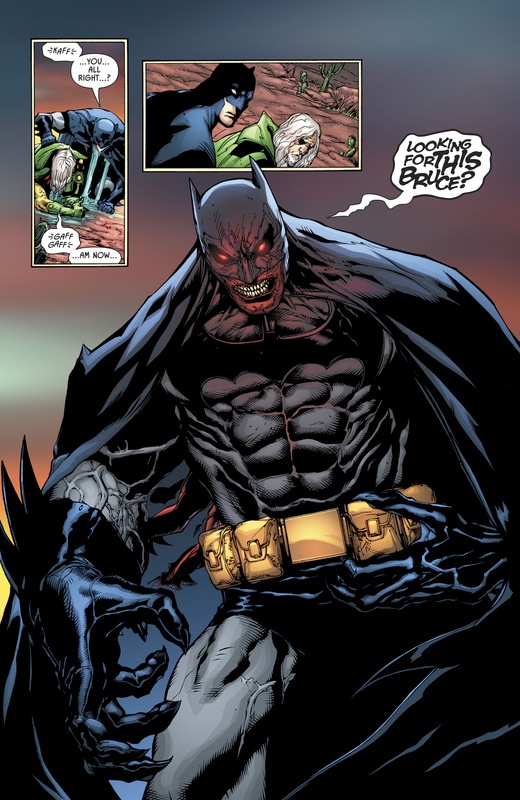 Tomasi's Batman is also scarily effective, barely playing around and almost immediately going for the win. He talks but doesn't wax meaningless poetics, and he's not afraid to talk about his feelings, but only to put silly assumptions that the villains have about his mental emotional state to rest. This is a Bruce who knows that he has problems, and knows how to deal with them, or at least keep them under control. In short, everything that I think Bruce should be. So what do you guys think ? Are you enjoying what Tomasi has been doing on the book ? And do you think Tomasi is trying to saying something about King's Batman, or am I reading too much into it ? Looks good. Probably going to wait for the trade to buy it though. All thanks to Aries for helping me change my avatar. Admittedly, I've been getting my Batman fix from auxiliary titles, primarily Justice League. But you've convinced me to give the Detective Comics run a shot. While next month's landmark Detective Comics #1000 is certainly not short of all-star talent behind the extra-sized anniversary issue, one of the most eagerly anticipated stories is from fan-favorite creative team Scott Snyder and Greg Capullo. The acclaimed duo behind the main Batman ongoing series during the New 52 era will reteam for a special story that introduces a brand new team of crimefighters to the DC Universe known as the Detectives Guild. 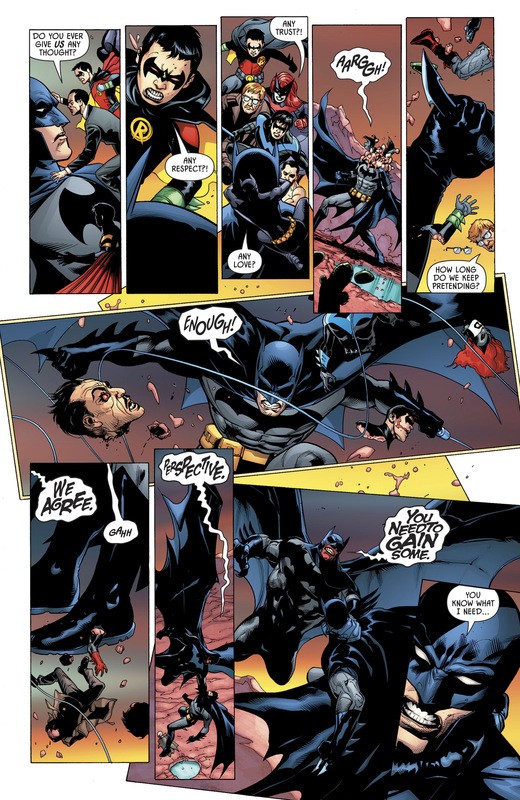 Consisting of Batman, Hawkman, Hawkgirl, Martian Manhunter, Elongated Man, Detective Chimp, original Detective Comics protagonist Slam Bradley, what appears to be the Vic Sage incarnation of The Question and Traci Thirteen, the team will assemble in the opening story to the 96-page anniversary issue. While details on the story itself are still under wraps, it will reportedly focus on Bruce Wayne's origins as a master detective as part of his global training to become Batman. Ah? So it's just like Spencer's Spider-Man run. I know you would like Tamasi's take on Batman more than King's. The shade he throws King's way is just icing on the cake. I think the fact that he is obviously writing an anti-Tom King Batman book was and is still obvious its a wonder more people haven't caught on. I find Tamasi's Batman good but not perfect, I remember his Batman and Robin which was good, it made me tolerate Damian. This is the best that Batman has ever been ever since Rebirth started. It has flashes of pre New 52 glory days, and you know how much I miss those. I mean, that's not much of a surprise, considering that I'd probably enjoy syphilis more than anything written by Tom King, let alone his abysmal Batman. Don't get me wrong, Tomasi is not writing one of the greatest Batman stories or anything, he's just writing Batman RIGHT, and that's something we've been missing for a long time now. I agree that all the shade he's been throwing at King helps a lot in making me appreciate his work. It's just the right book coming at the right time, and Tomasi has proven himself to be a competent Batman writer before, so I'm glad to see where he goes with this book. I love Snyder and his crazy ideas, so I'm up for whatever he wants to do here. This seems like a response to all the complains Snyder's Batman tends to receive on how he's too over the top and doesn't do much detective work. Also, I'm happy he's doing a story of this kind, because it might help shut some people up about how Bruce is a lousy detective, because bad writers can't write him well. I'm 3 issues into his DC run, and I'm quite enjoying it. Very refreshing to see Bruce being done well in at least one other form besides JL. The flavor is just right: A bit dark, a bit suspenseful, and just a hint of grandeur... and very well executed to boot. Additionally, I find Tomasi's quasi-Synderisms in his dialogue to be another great selling point of this book, at least for me anyways.